I should begin this page by letting you know that my family is a Christian family. We love Jesus, and are not ashamed of that fact. We try to make Him the center of our lives. This includes the adventure of dog-breeding. 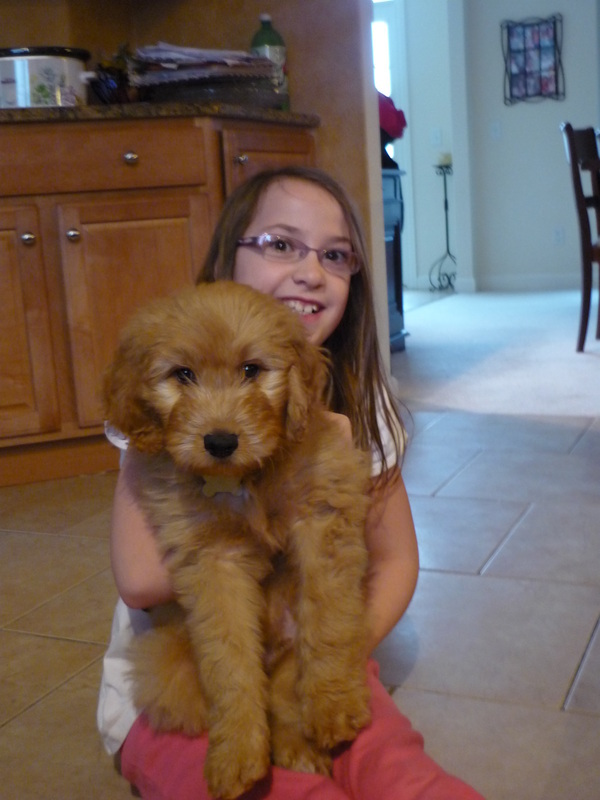 When we decided to start breeding Goldendoodles, it was because we love the breed, and also because I was looking for a way to get out of debt, while staying home with our young children. We would like to adopt more children, which can be expensive, but a little extra "puppy income" would certainly help! So, we prayed about it, and felt like it would be a good decision. We began our search for our breeding dogs, but we didn't want just any dog. We wanted dogs who had great temperaments, that we could trust with our children (who were 3 years old, and 10 months old when we brought Holly, our Golden Retriever, home). We also wanted to find dogs who had the potential of being trained for therapy work, which is one of my passions. We found our Standard Poodle (Indy) in Kentucky, and our Golden Retriever (Holly) in Indiana, and the adventure began. In our litters, we seem to always have at least one puppy each time that lets us know that God is definitely with us in this breeding adventure (of course we knew that, He's with us in everything. But we're only human, and it's nice to be reminded sometimes). In Holly's first litter, there was Otis. We were naming that litter after characters from "The Andy Griffith Show" (which is one of our favorite shows), and he was deemed "Otis" because he was fat and he drank too much. :o) Otis was a gorgeous puppy. He was huge, and a beautiful golden-cream color. He was, in fact, the only golden male in the litter. I loved him, and I always felt that there was something special about him. As I told one of my therapy-dog handler friends, I felt like he was supposed to do something, to be something. I considered contacting a service-dog organization, but wasn't exactly sure how to go about that. So, I have up on the idea. I should have known God had bigger plans. When the puppies were about five weeks old, and before we had begun advertising them, our pastor contacted my husband (who was in charge of our church's evening service) about a guest speaker who wanted to come and speak at the evening service. She was a missionary/nurse in the Dominican Republic/Haiti, and she wanted to come and tell about some of her experiences. My husband thought it sounded like a great idea, and got it all lined up. That evening, she came to speak. I learned that she was not only a missionary, but that she used her two dogs, a Golden Retriever and a Labrador Retriever, in her mission work. I was fascinated! Before the service started, our pastor's wife, who was sitting behind us with the missionary, Kristy, leaned forward to ask me how our puppies were doing. Kristy asked what kind of puppies they were, and I told her they were Goldendoodles. She told me that she had a friend who was about to graduate from medical school, and she wanted to get him a puppy for a graduation present. He lived in the Dominican Republic, loved her dogs, and longed for his own to use in service as well. She told me that she had been looking for Golden Retriever for him, but that the ones she had been looking at were a little out of her price range. She was looking for a golden male. I had only one. I told her then that I had he puppy. She came and met him that night, and fell in love. She knew that he would be perfect. She took him home with her six weeks later, when she went home to the Dominican, and he was old enough to travel by plane. What a great way to be able to tithe on our first litter! He is now working with doctors in the Dominican Republic and Haiti as a demonstration dog for children. Even though I didn't know how to go about getting that special puppy into service work, God's strength is made perfect in my weakness. 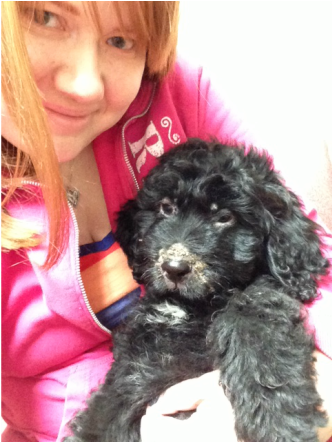 ​My husband and I decided that we would like to keep on of the female puppies that Holly had for future breeding with my mom's Standard Poodle. I had people putting in deposits on the second litter before they were born, so I new that I was going to have to choose mine right away, so that they could choose theirs. However, I didn't just want this dog for breeding---I wanted to be able to use her for therapy work. Now, Holly had great puppies, but some dogs' personalities are just better suited for therapy than others. And newborn puppies are not exactly filled with personality. So I was at a loss as to how to choose my puppy immediately. I wouldn't know their personalities for a few weeks after they were born. So, I prayed. I prayed that God would mark one of the female puppies differently, so that I would know which one was supposed to be mine. It may seem strange to some, but I believe that God is involved in every detail of our lives, including the little ones that might not seem important to anyone else. Because of this, it never even occurred to me that God might now mark one of the puppies. I was sure that when I saw my puppy, I would know her. The big day arrived, and Holly went into labor. The puppies came one after another, one golden, one black, one cream, another black...There were males, there were females, and they were all black, golden or cream. There was only one cream female...I thought maybe that was the one. But it just didn't seem as obvious as I had imagined it would be. And then came my Bridget. My solid black Bridget, with her bright white toes. It wasn't anything that we had seen on any of our puppies before, but her back toes were solid white. I was elated! Bridget became my constant companion, and I can tell that she truly was made just for me. There was no house-training with Bridget. She just went outside, always, when she needed to go. She is almost two years old now, and hasn't had an accident in our house. I have never seen a dog who was so attached to her owner---she definitely will not be finding a new home when she retires from breeding! 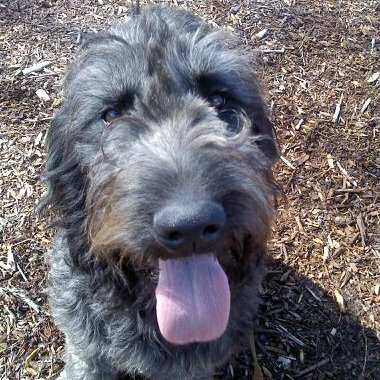 At six months of age, she visited a large group of second-graders, to show them what therapy dogs do. She will hopefully take her test with the AKC for her CGC certification soon. I'm also hoping to take her to children's hospitals, because she adores kids. The white on her toes has mostly grown out. She still has one white toe in the back. But the rest of her coat is like no other. She has turned into a silver dog, which was totally unexpected. She is absolutely gorgeous, and doesn't look like any of Holly's other puppies. God didn't have to make her that differently forever. I just needed to know in the beginning. But I believe that He made her such a different color to remind me every day that He loves me, He hears my prayers, and He cares about things that only matter to me, just because they matter to me. That's how our God works. On the morning of November 9, 2011, Holly did not appear to be in labor, so I didn't think much about leaving to take my daughter to school. When my five-year-old son, William, and I arrived home, Holly wanted inside. After being inside for just a few minutes, she started having contractions, and ran to her whelping box, where she delivered her first puppy. We thought. I have mentioned before that I know that God is always with me. Does that mean that things are always perfect for me? No. Always easy for me? No. That they always turn out the way that I wish they would? Um...no. But it does mean that I can recognize when God knows better than I do (you know, all the time. :o) . But, like most of us, I can sometimes forget that. In our most recent litter of puppies, Holly started giving birth around ten o'clock at night. That was the first time that she had labored through the night---all of our other litters have been daytime deliveries. Anyway, Holly had her first puppy at a little before ten, and had her eleventh puppy around four o'clock in the morning. I thought she still looked and felt like there was another puppy yet to deliver, but she wasn't having contractions, so I decided just to wait and see. Her contractions started back up around 7am, and she delivered her last puppy at about 8:30am. She was stillborn. This was a very sad moment for me. She was a big, beautiful, golden puppy. And, out of the 50 puppies that we've had born in our home, this is the first puppy that we've lost. I sat down on the couch, feeling very upset. I was glad that the other 11 had survived, but I was so sad about the 12th. About that time, my six-year-old son came downstairs in his pajamas, all sleepy-eyed and messy-haired, and climbed up into my lap. "How many puppies are there, Mom?" he wanted to know. I told him there had been 12, one hadn't made it. He looked sad, for a moment, then brightened and asked, "Can we take a minute right now, and thank the Lord for these puppies that we have?" In that moment, I knew what God was telling me with this puppy. Sometimes life doesn't go the way that we plan. Sometimes things don't make sense. Sometimes I might not like what happens. But God used my son, as he often does, to remind me that, as a good friend told me this morning, "God doesnt give us what we can handle, God helps us handle what we are given." And this morning, as I got to witness the tremendous blessing of my son wanting to worship his heavenly Father, I realized that the lesson from this puppy was for me. And I'm very thankful for it. Holly was having a difficult labor. She had been up all night delivering the first seven puppies, and now, at four in the morning, she was exhausted as the eighth and final puppy was finally making his appearance. When he was born, he startled me with his size. He was an enormous solid black male, with white markings on his chest. Holly delivered him, but did not pass his placenta, so he was anchored to his mom...for half an hour...at four o'clock in the morning. I remember sitting there, holding him while we waited on the rest of him to be delivered so that he could go free. I was so tired, at one point I fell asleep on the whelping box floor, holding him, and petting Holly, so she wouldn't stand and start pacing again (which could lead to his cord tearing in a dangerous place, since he would be hanging by it). So, Holly, Woody and I layed in the whelping box, sighing (Holly and me), shifting (all three of us), and singing (that one was just me). Woody and I had some real bonding time during that first tiring, messy, tense half hour. Finally, Holly delivered the placenta, and Woody was free. After his lungs were clear, and he was dried off, we put him in with the other puppies (where he looked like Gulliver among the little people). Woody developed normally, and was a favorite at our house. Both of the kids loved him, and nicknamed him Orca, because he was black and white, and huge like a whale. He was usually the first puppy picked up, and the last puppy put back down. When he was two weeks old, I noticed that Woody's chest was an odd shape. With a feeling of dread, I suspected what was wrong. Sure enough, when I looked it up, Woody was what is classified as a "swimmer puppy." His weight was so much that he was not pulling himself up properly, and his chest was flattening which was hindering the proper development of his rib cage. This results in puppies only being able to do a "swimming motion" rather than actually being able to put their feet under them and learn to walk. If left untreated, it can lead to the puppy needing to be euthanized. I determined, this was NOT going to happen to Woody. So, we started working with him. We put down carpet in the whelping box, to help him get better footing, and we began holding him up many times a day, and holding his ribs in the position that they should be in. We worked with him, and prayed over him. He loved all of the extra attention, and thrived! Within a week, he looked just like all of the rest of the puppies! I was hugely relieved that he was now a fully normal puppy. Swimmer puppies are not something I had seen before, and are not something I hope to see again. I was relieved that our little darling was okay, and could now find his new family. I started to let myself relax. He was doing just fine. When Woody turned six weeks old, I had him out of the whelping box, and was taking his picture (which he always seemed to enjoy---he's always known he was gorgeous :o) when I noticed that one of his lymph nodes under his chin was swollen. That I have seen before, although it makes my blood run cold the same way every time. Cellulitis. We called the vet, and got him in as soon as possible. He started on his medication, but cellulitis acts quickly, and he ended up losing the hair on his face. Good grief. Poor little guy. Now he was on medication, and was going to have to stay here until he was at least three months old, so that we could take care of him while he finished it. Not that he minded, since he received his medicine twice a day, covered in canned food. Woody seemed to think "if only every puppy were as lucky as me!". As he reached eight weeks, and was beginning to look a little bit better (it takes a while to completely reverse the effects of cellulitis), I noticed that he had developed a hernia. At this point, I was completely frustrated. I prayed, and asked God, why was everything happening to this puppy?! He was such a wonderful little guy, and thing after thing kept going wrong for him. That was when I looked down at the little puppy that I was holding, as he struggled to climb up and lick my tears away. Here was a puppy that I had prayed for from before he was born. And while he was being delivered. And when he had trouble with his development. And when he had gotten sick. And now, as I had found the hernia. I was miserable. I was a wreck. I was frustrated, and at the end of my rope with everything that was going on with him. And there he was, cuddling into my neck, and wiggling with joy. He wasn't just happy. He was excited, and filled with joy. All because I was holding him, just like he always wants me to do. His joy wasn't found in his circumstances---his joy was found in the one who loved him. I believe that God has blessed Woody, to be a blessing for the right family. And although we're still looking for that family (Woody is staying until after he's neutered and fully vaccinated), I know that he has a purpose, and that he will find the right home in which to bring his joy.